As a single mother bringing up three kids on a limited income, life wasn’t without its difficulties. However she did everything she could to enrich our lives in other ways. We read together every day, played boards games on cold winter evenings, and always, ALWAYS made things. Imagination and creativity were super important in our home. 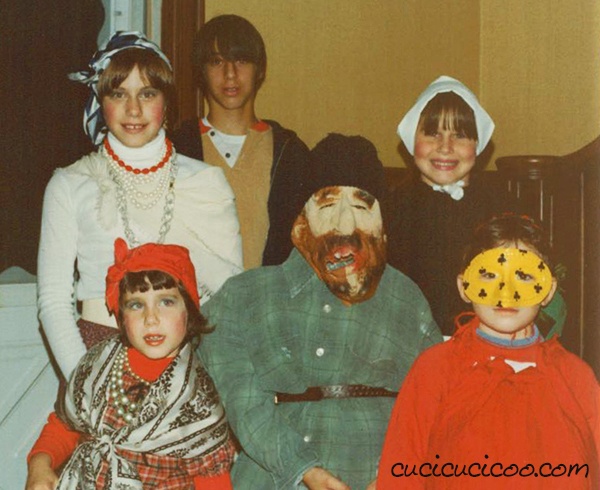 And so we were one of those families that always made their own Halloween costumes. Americans LOVE Halloween. It’s one of the things I miss every year as a US expat living in Italy. Here it isn’t celebrated much (kids dress up for Carnival/Mardi Gras/Fat Tuesday instead), but we’re starting to see a few organized Halloween parties where all the kids go dressed up in the same exact ghost, witch or vampire costumes. All store-bought, of course. And I think that these kids, and their parents, have no idea what they’re missing out on by buying costumes. 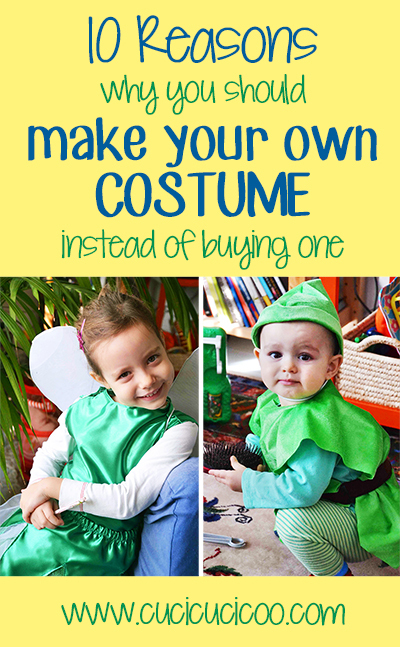 Because there’s more to making your own costume than simply penny-pinching. 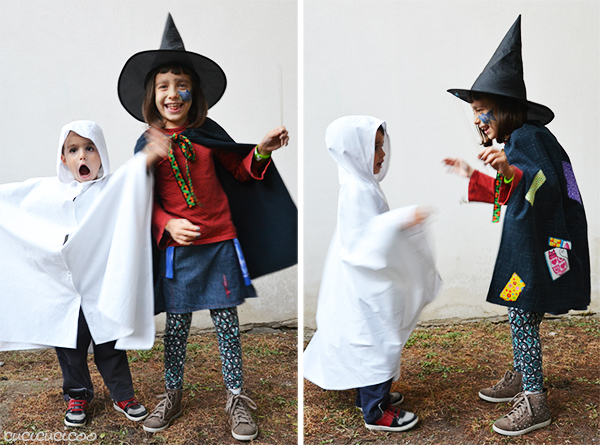 DIY costumes stand for a whole series of values, for an entire way of life. 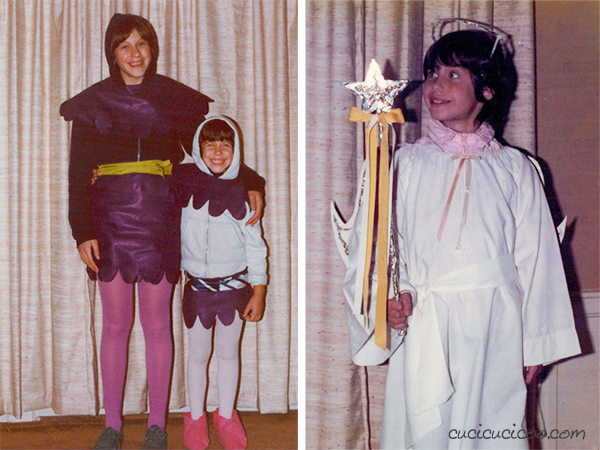 In lieu of a DIY tutorial, today we have a slightly different post than usual, illustrated with pictures of my own DIY costumes spanning my childhood in the 1980s. So get ready for the 10 reasons why you should make your own costume instead of buying one, to illustrate the life lessons I’ve learned from my mother! The mass production of clothing has a terrible impact on the environment. Massive amounts of water and pesticides are used for growing cotton and other natural fibers, and synthetic fibers are often made with petroleum by-products that do not biodegrade. There have been many reports of huge amounts of dyes and other chemicals dumped into rivers and other water sources. And of course the same goes for the mass production of costumes. I doubt that my mother knew about any of that in the 80s, but she knew the importance of using what you already have instead of always buying, buying, buying more, more and more. 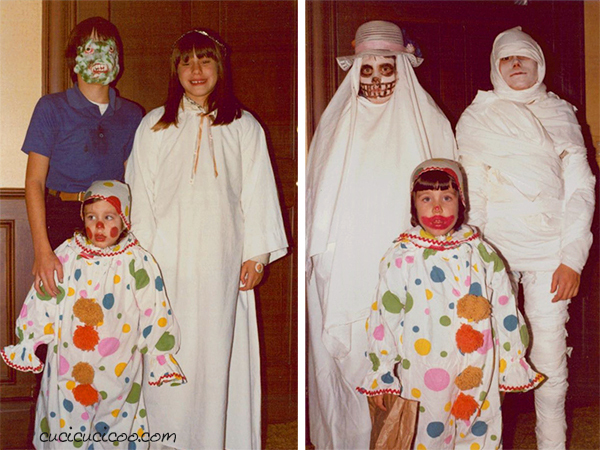 Three of the costumes my siblings are wearing above (angel, ghost and mummy) were made from my grandmother’s old white sheets that she had been planning on throwing away. I, on the other hand, am wearing a homemade clown costume that my mother borrowed from a friend. Again, she used what she could get, even though in that case it was already made! 2. It’s the little things that count. A lot of times we parents put a ton of effort into things for our kids that they don’t even notice. Because the things that matter to little kids are usually details that we grown-ups never would’ve even considered. For example, when my sister and I dressed up as gypsies with my grandmother’s shawls and costume jewelry, the thing that thrilled me most was wearing tons of makeup. That’s actually one of my earliest memories, puckering up my red lips, feeling so grown up! So what if we stop worrying so much, and learn to appreciate all those little things in our lives? Wouldn’t we all be so much happier… not to mention less stressed out? I’m pretty sure that most people think that people who make their own costumes (or clothes or anything else) do it just to save money. There’s no denying that it’s true, even though it’s just one of many reasons people do it. But heck, have you seen the pricetags on some costumes? While I can sometimes justify spending a lot of a quality garment that will be used a lot, I can’t justify emptying out my wallet for a costume that’ll be worn just for a few hours. 4. The family that plays together, stays together. The last couple of weeks of October was a time to talk together and plan out our costumes. They were a reflection of our interests and then problem solving as we figured out how to put them together. For example, when my mom read The Door in the Wall* with my brother, we talked a lot about Medieval times and got the idea for my sister and I to dress up as Medieval pages. (Well, I probably had less to do with the planning at that point because I was only six and probably had no idea what anything Medieval was, besides Robin Hood*.) A bit of felt put over hooded sweatshirts and tights, and we were golden! That was one of my favorite costumes of my childhood. The whole process of planning and creating costumes is a wonderful quality time activity to do together, and the special bond when you have matching costumes with people you love is the best. By the way, have you noticed the heavy jackets under a lot of these costumes? 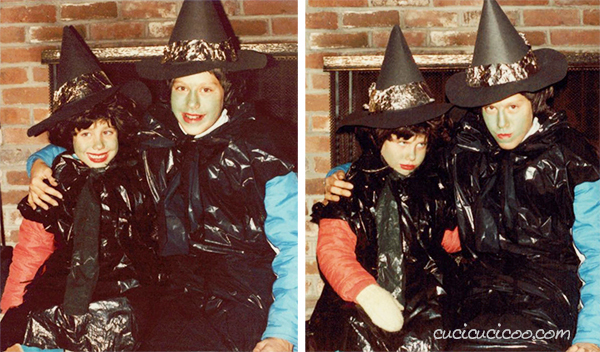 I grew up in Massachusetts, so one important requisite for Halloween costume was to be able to keep warm while being dressed up! Previous articleDIY backpack rain cover from umbrellas! Such cute costumes Lisa. I totally agree with you about making your own costumes. All it takes is a little creativity. I cannot for the life of me justify spending money on an outfit that you will only wear once. Thanks, Mary! I know, it’s nuts how much some costumes cost. And they’re so much less fun! Sì, Federica, l’hai detto perfettamente: l’amore! Si sente la passione e la gioia in costumi fatti in casa, e questo è molto più importante che essere all’altezza, come dici tu! Ho letto il tuo racconto,sono d’accordo con te. What fun pictures and fabulous costumes! I love the idea of making them yourself and using what you have. Pinning to my Halloween Board. Thanks for partying with us! Lovely post. Also I think I enjoy making costumes as much as Emma enjoys wearing them. That is so true, Cintia! It’s so much fun busting out all the creativity to make the most creative things possible! And seeing as costumes aren’t supposed to look like regular clothes, it doesn’t even matter that much if you mess things up, so there’s less pressure!